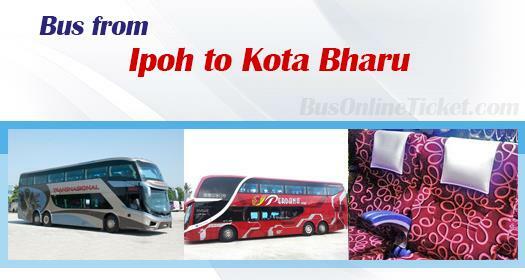 Bus from Ipoh to Kota Bharu is the only public transport connecting the two cities. Perdana Express and Transnasional are the only two reliable and quality coach company in providing bus from Ipoh to Kota Bharu. They each provide 1 morning trip and 1 night trip to Kota Bharu from Ipoh Aman Jaya Bus Terminal. Perdana Express is using double deck VIP bus to serve route. While Transnasional is deploying standard VIP bus. Both type of coaches are equipped with reclining seats. Spacious reclining seat ensures passengers having comfortable journey to Kota Bharu from Ipoh. The journey from Ipoh to Kota Bharu takes about 6 hours via East Wes Highway after passing the small town Gerik. Aman Jaya Bus Terminal is the boading point in Ipoh since the closure of Medan Gopeng Bus Terminal in year 2013. While the arrival point in Kota Bharu is at Kota Bharu Bus Terminal located next to the AEON and Tesco malls.The bus fare is reasonably charging in the range of RM 36.50 – RM 38.50. Considering the long hour journey, the trick is to take the evening bus at 22:00 for time saving purpose. Spending the journey with the overnight coach to Kota Bharu could save your precious day time to more important agenda. By taking overnight coach, passengers can sleep though the journey and arrive fresh in Kota Bharu next morning. Passengers are encouraged to book your bus ticket in advance to avoid disappointment due to the limited bus service from Ipoh to Kota Bharu. Online booking with BusOnlineTicket.com is the most convenient booking service because it saves your journey to outskirt Aman Jaya Bus Terminal to buy ticket over the counter. BusOnlineTicket.com is the trustable and reliable portal among its customers throughout these years.